﻿World Refugee Day: Calendar, History, Tweets, Facts, Quotes & Activities. World Refugee Day serves to commemorate the strength, courage and resilience of millions of refugees that have been forced to flee their homes out of fear of persecution or to escape disasters. The day also aims to recognize refugees for their contribution to the world. According to the United Nations, there are more than 50 million people displaced by war and violence, of which 33 million are internally displaced while the other 17 million are refugees, mostly in neighboring nations. 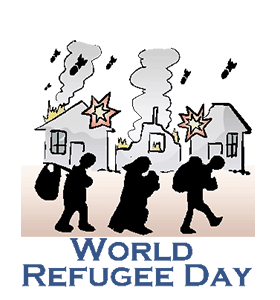 The United Nations General Assembly designated World Refugee Day in December 2000. It is celebrated every June 20th, a day chosen in order to coincide with Africa's previously celebrated Refugee Day. According to a 2011 report by the United Nations High Commissioner for Refugees, 80% of refugees were in developing countries. It is estimated that 50% of refugees are under the age of 18. Currently, the Syrian refugee crisis is the worst that the world has seen since World War Two. The country with the highest number of refugees is Pakistan with 1.6 million refugees. Under international law, refugees are not allowed to be forced back to the countries they have fled. I know what it's like when you are a refugee, living on the mercy of others and having to adjust. – Martti Ahtisaari, the tenth president of Finland. Share the hashtags #WorldRefugeeDay and #RefugeeStrong on social media to spread awareness. Watch a movie about refugees. Some options are: Refugee (2000), Hotel Rwanda (2004), Children of Men (2006) and In this World (2002). Donate or volunteer for the UN Refugee Agency. All proceeds and time go toward helping resettle current and future refugees so that they have safe and healthy lives. Print out the World Refugee Day campaign posters in support of the day. Post them around your home, workplace and anywhere else you think they should go in order to help raise awareness for the plight of refugees. Donate old clothing, non-perishable food, medical supplies and extra household items to a service that will transport them into an area with refugees.